Extraordinary Dogs: How can service dogs help Parkinson’s? Service dogs are specialty trained to help and protect people with vision, hearing, physical and emotional challenges. Some of the earliest and well-known use of service dogs is the use of guide dogs for blind or visually challenged persons. 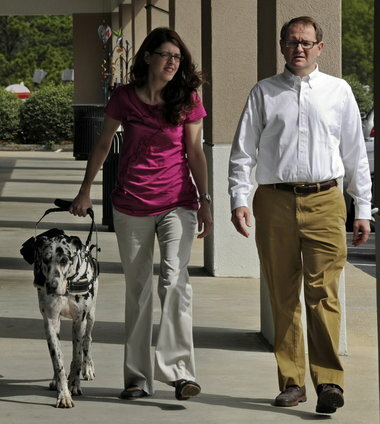 Many people with Parkinson’s Disease use a Mobility Assistance Dog. Sometimes a special harness is worn by a Mobility Assistance Dog made for pulling objects, such as wheelchairs or helping someone balance. Help with physical tasks around the house such as turning on light switches, opening and closing doors, picking up objects. Assist with walking by helping with balance, act as a support or help a person get up. Hold a person up if they are dizzy. Overcome freezing of gait. This can be done by clearing the way in crowded areas, by using gentle pressure on a person’s leg or leading a person away from a hectic and stressful area that can exacerbate freezing. Exert a calming effect at times of stress and anxiety. Assistance Dogs International www.assistancedogsinternational.org/. This site offers information on service dogs with FAQ. Paws with a Cause www.pawswithacause.org/what-we-do/service-dogs. This site offers general information. Nationwide Assistance Dog Group and Training Listing http://landofpuregold.com/service-groups.htm. This site lists training and service dog programs by state. Please remember not to interfere with a working Service Dog. This lovely video clip will remind you why!